I’ve been spending more time lately trying to organize my three lives: family, work, and online. I’d like to spend as much time as possible with my family, but I have to keep my other obligations in mind. My work life currently consists of the typical 8-5 M-F grind, but I hope to fix that within the next five years. My online life is becoming more time demanding and eats into my family time, but I see it as a means to break free from my work life. Since my online activities are requiring more time (and since I don’t want to take that from my family time), I’ve had to get seriously organized about how I do things. I’ve been honing my schedule over the last couple of months, and I think I’ve landed on something I’m happy with. Interestingly enough, Vivien from Inspiration Bit announced a group writing project on the topic of Time Management shortly after I finalized my schedule. So now I have absolutely no reason to not share my thoughts on time management. Each day, I have about three hours to myself in that period of time after the kids go to bed and before my wife gets home from work. So I’ve set myself a 7-day schedule that addresses my blogging and photography activities, in addition to what I post on the blog each day. Do note that I reserve the right to change or deviate from the plan as often as I like. It’s just a guide for myself. The 7-day schedule seems to be working great for the activities listed, but there are a few other things that I have to attend to on a daily basis (and I usually take care of them several times per day). Blog comment moderation and replies. Flickr contact photos, favorites, comments. Zooomr contact photos, favorites, comments. You may have noticed I left out the “Taking Pictures” activity from my schedules. It’s not to say I don’t plan on taking any more photos, but when I do it’s typically not planned that far in advance. So that’s basically how I manage my non-work and non-family time. The schedule keeps me focused on any given day, and it also prevents me from forgetting or neglecting certain activities. I must say that there’s a sense of relief in hot having to think about every activity every day. So how do you manage your time as a blogger and/or photographer? Or do you? This entry was posted in Features, Productivity, Projects on September 10, 2007 by Brian Auer. hmm… that’s very interesting. 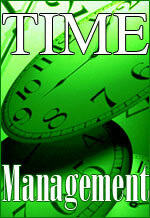 thanks for sharing your time management with us. you’ve got me intrigued with the “build secret websites” :-). Does it mean that you do social network only on Tue and nothing on other days? Once a week checkup on stats and marketing – making a mental note on this one. Sat – write articles. Do you write articles in one day for the rest of the week, or what? Haha — secret websites. Right now it’s just one that I’m working on, and I hope to have it running by the end of the year. It’s not really secret, but I’m just not ready to talk about it yet. The social networking on Tuesday just means that my main focus is to visit all 13 of my active networks and take care of messages, friend requests, finding new friends, updating profile content, etc. I still do the social bookmarking with digg, StumbleUpon, del.icio.us, and others on a daily basis. I just don’t visit things like FaceBook and MySpace every day. As for the stats, I usually peek on the basics from FeedBurner once a day (30 seconds max). But Sunday is the day for Google Analytics and digging into what really went on with the visitors. Then I apply my newfound knowledge to ideas for marketing and promotion. Plus I do research on marketing — like tonight I was reading through some eBooks on blog marketing strategies. And Saturday IS the day of writing. I write for the entire week (excluding the link roundups and photo dumps). It’s so nice not having to worry about coming up with content on a daily basis. I wrote this article while hanging out with the kids at the park. While they were playing with the other kids, I was sitting on the bench and writing in a notebook. I also often do some of my writing or work when going out with my daughter, she’s playing with other kids, and I’m working, while keeping an eye on her. I don’t manage my time to the extend that a schedule is set, but my time off work would be spent on reading others’ blogs; books; and taking photos at weekends. I did’nt see anything about speaking to your parents. Just let me know when you might have a time slot open and mom and I will check if it is compatable with our time managemant schedule. I have taken time out from my regular schedule to respond to this so you owe me. as you know we are very busy in idaho getting ready for snow. Later Dad. * March -> October: Drive dump truck. * November -> February: Take vacation. Of course, I’m not saying I’d mind taking off work for 1/3 of the year. But then again, I don’t have to work 12 hour days when I DO work. Pingback: What’s Your LEAST Favorite Weekly Topic?